Jan Hunter is back!! 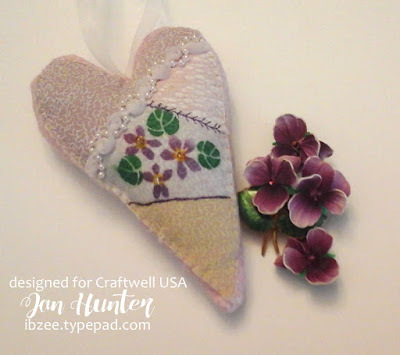 Sharing "Vintage Violets"
We are so delighted to have Jan return! Her wide variety of crafting skills is amazing. I love this and can see it filled as a sweet lingerie pomander! Hi, Jan here! 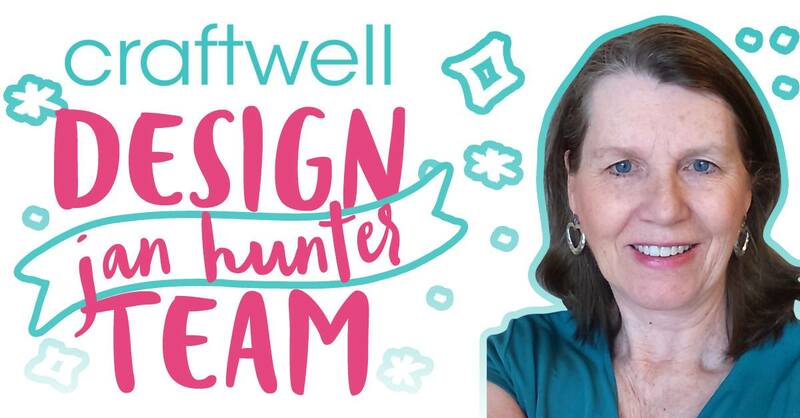 I'm thrilled to be sharing creative ideas for another design team term using the eBrush! Today's project involves fun stenciling and coloring using the eBrush! 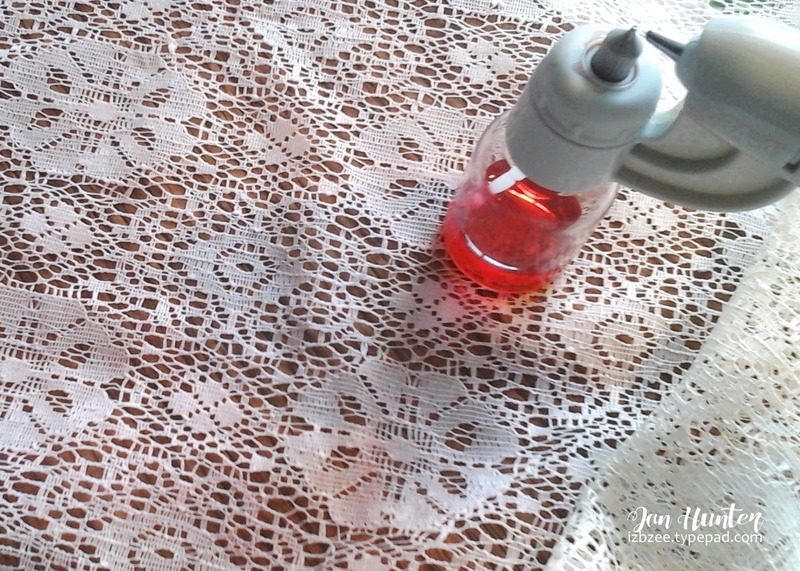 I love what you can do with fabric and the eBrush and use some quilting techniques too -- so let's check it out. Brew your tea. Set aside to cool. Depending on the size of your heart, cut a piece of fabric that will accommodate your stencil. Stencil using the ebrush and markers. Add details as desired. Make sure the fabric is completely dry before the next step. Set up your siphon. I prefer to use a bottle - and add some tea. 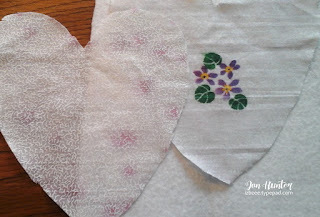 spray your fabric pieces that will make up the pieces of your crazy quilt heart. Be sure that all your surfaces are protected as there will be a little bit of overspray. I used a fruity tea that had a light blue cast when dried after a light spray and added a second more saturating spray to other fabric pieces for different colors. Remember, I'm starting out with all white fabric for the quilted heart. 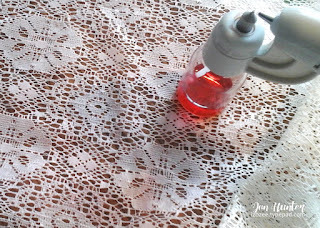 Don't forget to color you lace pieces as well. When these pieces are dry, you may want to consider another spray with some regular tea. Once all your pieces are dry, stitch your cray quilt heart top together. (I have more detailed directions on my blog)... save any tea, you may want to use it one more time. Cut a piece of the batting the same size as your quilted heart. 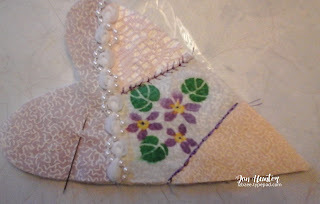 Using the embroidery floss and a needle, add some detail stitching at each of the seams in your "quilt." Be sure to add an trims and beads in this step as well. Cut two pieces of muslin and two pieces of your coordinating fabric. 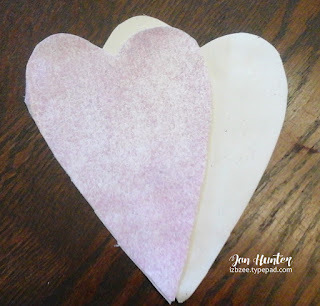 Stitch these hearts together leaving about 2 inches unstitched so you can stuff the muslin heart. I put the muslin heart inside the other heart and then filled with poly pellets, stitched the muslin closed and then stitched the outside heart closed. Center the quilt on top of the heart -- pin in place. Using the embroider floss, and a blanket stitch, stitch the outside edges of your heart to the stuffed heart. If you want a more vintage look, spray lightly with the tea one more time and let dry. 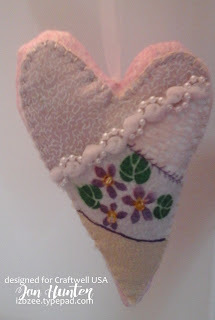 If desired, add a length of ribbon to hang the heart. Use as a decor piece or as a pincushion. Thanks for dropping by. Be sure to stop by Craftwell's blog again tomorrow and Friday for more fabulous projects. Enjoy some crafty creative time this week! That is so PRETTY!!! LOve it!! !